The control of Total Plate Count (TPC) is major challenge to global food manufacturers. Polylysine has been accepted as food antimicrobial of natural origin and it is acknowledged as label-friendly. Polylysine shows high antimicrobial activity against fungi, Gram-positive and Gram-negative bacteria and exhibits good water solubility and heat stability, and does not have an unpleasant odor. However, impure Polylysine contains more or less chloride and inorganic contents, increasing the risk of endotoxin and possible interaction with other ingredients. 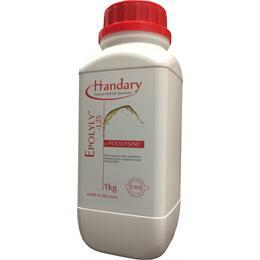 At Handary, Epolyly® is pure ε-Poly-L-lysine derived naturally from a submerged aerobic fermentation of Streptomyces albulus PD-1. With a high antimicrobial activity against fungi, Gram-positive and Gram-negative bacteria, Epolyly® is an ideal natural antimicrobial for extending shelf life of a variety of foods. 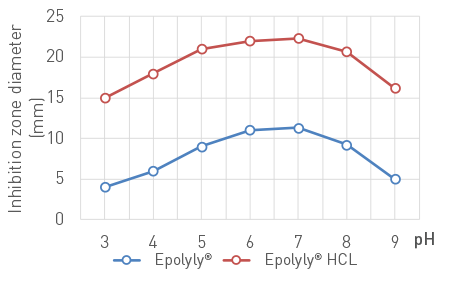 Epolyly® is pure ε-Poly-L-lysine derived naturally from a submerged aerobic fermentation of Streptomyces albulus PD-1. With a high antimicrobial activity against fungi, Gram-positive and Gram-negative bacteria, Epolyly® is an ideal natural broad-spectrum antimicrobial for extending shelf life of a variety of foods. 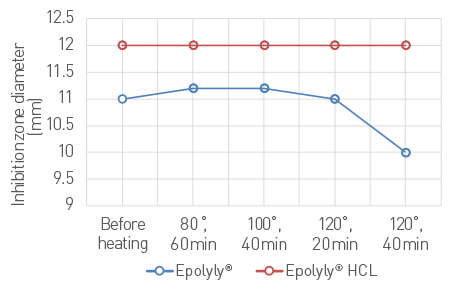 In general, to deploy Epolyly® dipping solution with cold boiled water or distilled water, then direction to add into foods depending on exact application. Approximate values for Nutrition labelling per 100g. Contribution to energy level is insignificant at recommended usage levels. 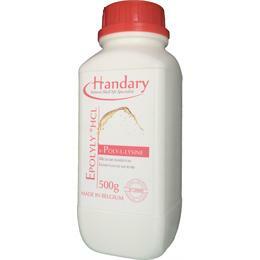 Epolyly® is available in 500 gr/bottle or 50 g/pouch with integral, tamper-proof seals. Packaging is available in other quantities. 24 months, store unopened below 20°C in dry conditions, away from direct sunlight and odorous products. When opened, store at approx. 20°C in original container. Shelf life is 24 months when stored according to recommendations. Epolyly® ε –Poly-l-ysine has been approved as a food preservative in 4 countries, including China, Japan, South Korea and the United States. Its addition level for commonly consumed foods ranges from 0.005% to 0.05%. The regulations governing the use of Epolyly® vary considerably in the countries in which it is currently approved. Advice regarding the legal status of this product is available as appendix1. Epolyly™ ε –Poly-l-ysine has been approved as a food preservative in 4 countries, including China, Japan, South Korea and the United States. Its addition level for commonly consumed foods ranges from 0.1-2.5 g/kg.